With makeup being expensive it can be hard to grow the collection of your dreams especially when there are so many products required. Getting into makeup properly at about 13 years old, I didn’t feel like I would ever have the collection I have now that enables me to pretty much create any look I like. 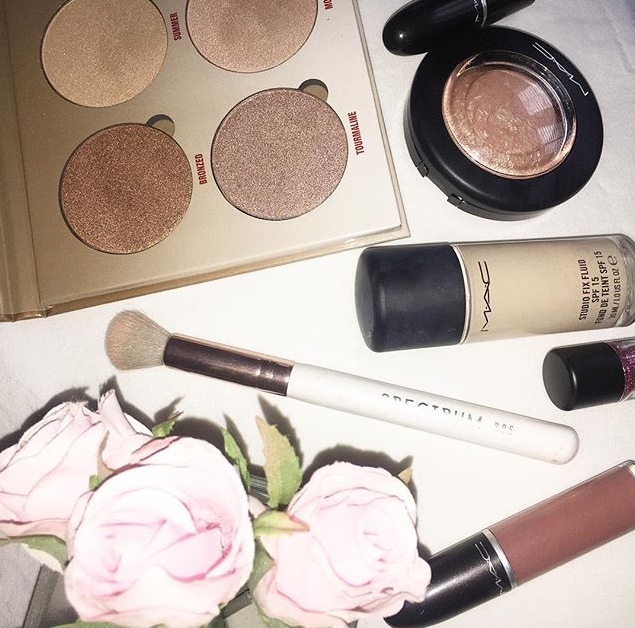 Here are my tips on how to grow a makeup collection! Writing a wish list identifys what you really want. Only buy from the wish list to avoid impulse buys or tempting cheap drugstore prices of things you don’t need. If you are saving for a really high quality, high end product, don’t go into the drug store and buy loads just because it’s cheap. Sometimes these things don’t work well and by the time you have finished getting lots of low cost products, you probably could have got yourself that amazing highlighter or the beautiful eyeshadow palette you’ve wanted for everrr. Set aside a small amount of money each week, I usually put aside my £5 pocket money for make up funds and money from work goes on life costs, this will soon add up and you can purchase quality products every month or so. Sounds small but definitely adds up alongside birthdays etc. Small jobs like baby sitting or doing other people’s makeup can provide money doing something that you enjoy. Take your new funds straight to the shop the next day and treat yourself to a new product to add to your collection! Remember, your not getting sent PR so don’t feel like you need to have a makeup collection like the beauty gurus. It’s not realistic and there comes a point when the amount you’ve spent on make up becomes slightly scary and probably should have been spent on your education or travelling. Makeup is expensive so you want to know that whatever your are buying is really, really good. Today I have a selection of amazing products you actually NEED. These products have stood out from all the products I have tried and are ones that have been reached for time and time again so I thought I would share some products totally worth the money. Where do I start? The colours are stunning. It’s so pigmented. It blends beautifully. The quality is incredible. The texture is buttery. So many different looks can be created. The modern renaissance palette WINS eyeshadow. This foundation covers everything, literally every single thing. My skin always looks so good with this and the majority of the time I get compliments, this will be the foundation I’m wearing. It’s such a boost of confidence and I would recommend to anyone who struggles with their skin or wants a foundation to actually last all day. Magnificent metals are the no fuss, fast track way to mesmerising glitter and shine. Being almost a glue and glitter in one, a fabulous cut crease can be created in seconds. My favourite shade is kitten karma- a gorgeous rose gold- but there are multiple other shades from deep shimmering black to a dazzling silver. These are a cut crease fan’s best friend. Make up geek eyeshadows are so easy to work with and the fact that you can choose the colours avoids that one ugly unused shade situation (always a bonus). Creating your own palette is so much fun and MUG absolutely nailed the formula, they blend so well and are really pigmented. Loveee them! Rimmel’s stay matte had to be on the list at just £3.99 (often less in a 3-for-2 deal). It may be cheap but it works so well. Makeup stays put all day, I bake with it, set my eyes and use it to carve out my contour. It’s such a versatile product: swipe the powder with a beauty blender to bake/carve or set with a brush. This is one to buy right away! Hope you enjoyed this post and if you like the look of anything, happy shopping!